I think I know how it is pronounced, but I can’t be certain. I’ve never had a misunderstanding when ordering. Sometimes I just point to the number next to it on the menu to avoid embarrassment. The waiters understand. If I called it Fa instead of Fuh…or Pho instead of Faux would I create an international incident? I think not. The snow—or is that sleet or freezing rain—might be coming down for the 500th time in this endless winter, yet I’m inside happily slurping noodles in a warm aromatic oxtail-based, star anise-scented broth. 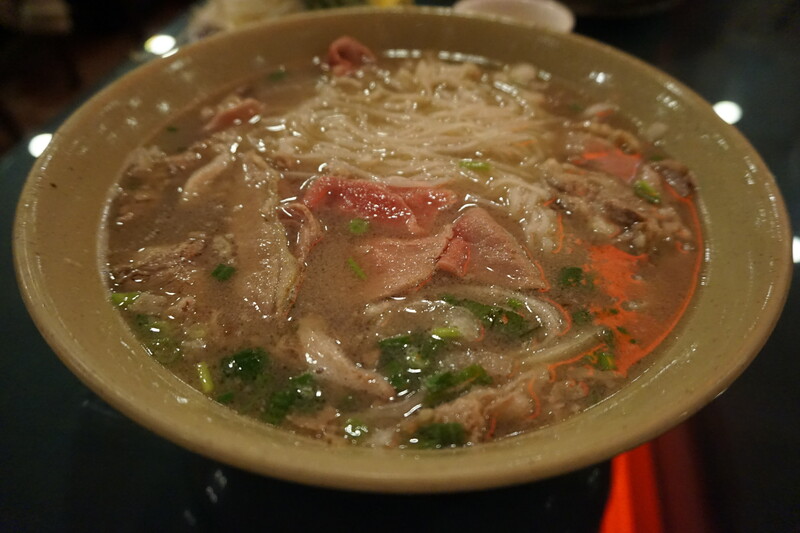 The ability to pluck out thinly-sliced, braised in the broth, round steak—or maybe a gelatinous piece of tendon with chopsticks adds to my sense of contentment. When I eat Pho, I often think of Otis Redding’s “Sad Song,” also known as “Fa Fa Fa Fa Fa.” But there is nothing sad about this Fa. Oh but where? & awesome MG’s footage ! That Pho was courtesy of Thai Son on Baxter Street in Chinatown, NYC. Hey Brian. It’s always nice to get an image of the city, even just a walk in the cold and hot bowl of soup. I appreciate it.